You’ll have to forgive me if I make any gross spelling, grammar or editing mistakes in this post, I have not had a great deal of sleep in the last few days. 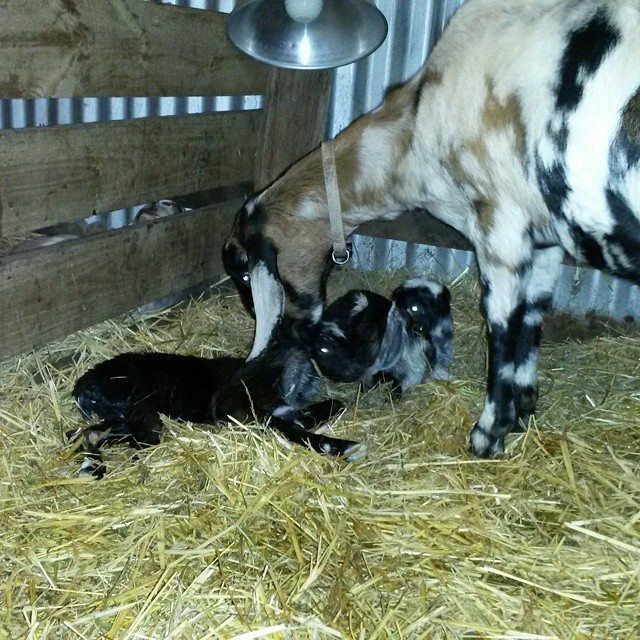 The first kids for the season were due last Monday, and Meredith kicked things off with a fabulous pair of twin does. This was the first time I have actually seen Meredith give birth. She has a history of quietly slipping out large doe kids without much noise or fuss. This year was no different, I saw the first kid born via the baby monitor while I was waiting for my toast to cook. I only saw the second kid being born because I was out investigating the first one. Meredith is a big doe, and her kids have all been over 4kg at birth. 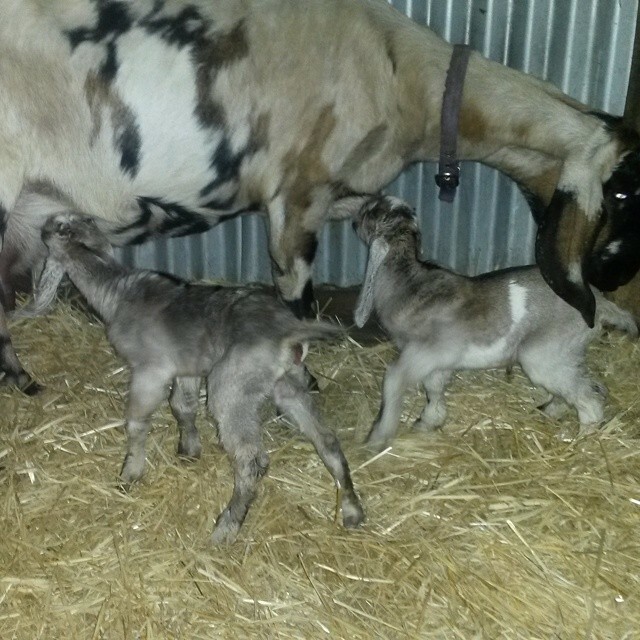 She has them up and feeding in no time and is a wonderfully attentive mother. Juno was due the day after Meredith, but managed to have me checking her twice a night for the entire week. Finally, Friday night, ligaments gone and signs of labour. Ideally, Anglo Nubian does shouldn’t kid until they are close to 24 months old. Juno was what goat breeders refer to as a ‘child bride’, a doe who finds herself in kid in her first breeding season and kids as a young goatling around her first birthday. Those who say that animals live up to their names would argue that I was asking for trouble giving a goat the same name as a movie about a pregnant teenager. I was very keen to be on hand to supervise Juno’s kidding. My little dot had accidentally got pregnant on my watch, and I had decided to let that pregnancy continue. It was my duty, my responsibility to make sure that she gave birth as safely as possible. A doe who labours for too long without making any progress is at risk of a ruptured uterus. Even if she gets the kid out without being injured herself, kids may not survive protracted labours. I watched Juno work very hard for about an hour before she got her kid to the point where I could see its feet when she pushed. And that was as far as it would go. It was time to intervene. I was about to go inside to get some soap and water and scrub my hands when I was struck by inspiration. As Juno gave a particularly strong push, I was able to grab the kid by the front feet. The next few minutes were intense. Juno shouted the house down as Matt held her front end in a bear hug and I pulled the kid’s front legs down towards the ground. For a terrifying moment there was no progress and I was afraid that we would never get that kid out, or that I would injure it if I pulled any harder. But then suddenly it yielded to my efforts and the kid slipped out onto the ground. I left the pen to get towels from the feed room, and by the time I got back Juno was tentatively cleaning her baby. Kids are excessively gooey when they are born, but a good doe will have them clean and dry in no time. Juno did a pretty good job, and I left her to it for a little while. The kid was vigorous and talkative, both good signs. It had great broad shoulders and a clunky Nubian head, which made me think it was a little buck. Child brides are notorious for producing very nice single buck kids. Finally I picked up the kid to put it under the heat lamp – it was all of three degrees in the barn – and I checked under the tail. A little doe! I was pleasantly surprised. Matt went inside to get a bottle and teat so that I could make sure the kid got some colostrum before we left the new mother and baby to figure out feeding. Before he got back, Juno lay down and quickly produced another kid. She got this one out on her own, and this one was a buck. My diminutive one-year-old doe, who can’t weigh much more than 35kg herself, produced not one, but two, strong and healthy kids each weighing around 3.5kg. By the time the sun had come up, little Juno had figured out how to feed her little family and the three of them were comfortably ensconced under the heat lamp. Juno’s daughter has been named Elcarim Elizabeth. Being a double cross to my Tasmanian-bred senior buck Capricorn Cottage Tazzy, we named her after the main street of Hobart. We have one other doe who is line-bred to Tazzy, that being Elcarim Victoria, so it is fitting that these two girls are named after queens. 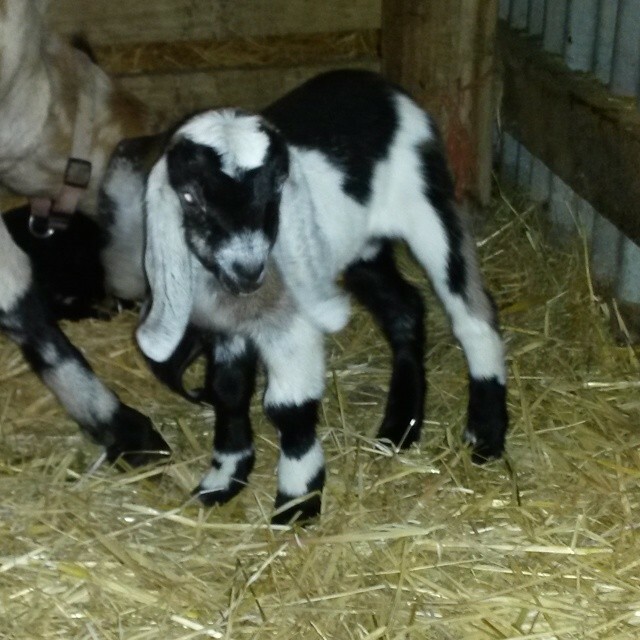 The little buck has been named Abel (as in Tasman), and he has a home waiting as a pet wether with another of Tazzy’s sons, Ajay, the offspring of last year’s child bride, Tylden Park Ambika. Ambika is due to kid on September 2nd this year, and she has grown into a tall and stylish young doe. And yes, she was the one who knocked the box of tissues into the water bucket, due to her complete inability to mind her own business, and my currently persistent runny nose. Victoria is due to kid in three days, and thankfully she doesn’t look like she is ready yet. Matt has surgery scheduled for the day after tomorrow so there will be nobody home all of that day to keep an eye on her. After last year’s wacky shenanigans of Rianna kidding while I was in hospital and Sienna producing triplets the night after my pacemaker replacement I am not confident in the capacity of my does to kid at times that are convenient to their human food slaves and midwives. I’ve really dropped the ball in here lately, my writing hands have just gone on strike and I haven’t felt compelled to put anything down in print for a couple of weeks. But it’s that thing about how the more you use something the easier it is, so I’m going to start typing and see what comes out. It is pouring with rain here and has been for hours. It has rained so much in the last week or so that I have turned on the hoses to drain water from the tanks in the goat areas down and away from their places of shelter. And I think the tanks are still filling faster than I can discharge the water. The does are very comfortable in the big shed with all the hay they can eat and an indoor water source. The kidding pens have been cleaned out, and just need some straw put down in order to be ready. The two spotty does, Meredith and Juno, are due any time now, but not looking terribly imminent. Kidding is stressful and exciting. The bucks are not having such an easy time, as their makeshift shelter is smaller and has a dirt floor. I have put down a thick layer of straw and given them a big tub of hay, so at least they an eat and lie down without getting wet. The chooks have stayed in the big chook house today, it is even too wet outside for them. The ducks and geese, however, are having a grand time. My cheese fridge lay down and died a few weeks ago, and a part had to be ordered from overseas. I am still waiting for the repairer to come back and fix it. I want to make more cheese! Yoga has become my exercise of choice, with Hot Yoga slightly edging out the regular Hatha. The heated environment is a great comfort when it is five degrees outside, and the extra stretch afforded by warm muscles is also a bonus. But I think what really attracts me is that slightly altered state that comes from working quite hard in the heat. It takes the mind/body benefits of yoga to a higher level. I am becoming stronger and more flexible, even three weeks in. I can now do poses that were actually not possible when I first started. I can maintain a full plank for more than two seconds. My sugarlessness is going well, although pretty much everyone thinks it is a silly idea (there is sugar in everything, do you eat fruit? there is sugar in that, everything in moderation I say), I find it beneficial for me and that is all that matters. I am slowly adjusting my attitude to fat in my diet, and while I still wouldn’t eat a packet of chips, there are some high-fat foods that I am starting to eat more of and at the same time I am fitting back into my size 8 jeans that I haven’t been able to wear for ages. Something is working. I had my hair cut by an actual hairdresser and she was very complimentary about the general condition of it. That is six months without shampoo, and going strong. I will need to colour it again at some point, but I’ll cross that bridge when I get there. The protein hair masque that my sister made is pretty well magic, and fixes that straw-like feeling when my hair gets too dry. I am yet to go back to the razor, and you would think that if anything would reveal hairy underarms as being a source of unbearably bad hygiene it would be hot yoga, but your argument is invalid because deodorant. I am no more or less smelly than I was when I did shave, so ner to all the people who think hairy armpits on women are ‘gross’. If you don’t like it, don’t grow yours. I did read an interesting comment about how because women are taught to remove their body hair from the day it starts to become noticeable, many of us have no idea what we even look like with such hair. And I was like, bloody hell, I’m 36 years old and I have no idea how long my underarm hair will even grow if I let it. What a sobering thought about the expectations that society imposes upon us. We don’t even get to see what our body hair looks like before removing it, we just remove it because of imposed standards of beauty and justify it by saying it is our choice. Maybe it is just a phase I’m going through, but I spent many years not feeling like I wasn’t really allowed to be myself, so now I am trying on different things to find out what it is I really want to do when it comes to my own body. I definitely do not want to alienate anyone who does shave or wax, because there are a lot more of you than there are of me. There are a lot of things I do or don’t do that are different choices to those that most people make, but they don’t change the sort of person I am. If you saw me in the street and didn’t know me you would never guess that I don’t eat sugar and I don’t watch TV and I wash my hair in home-made goat milk soap and I don’t wash my clothes in detergent and I don’t shave or wax the parts that most women do. You would never know if I didn’t tell you. I live in a fairly isolated little bubble. The only time I really link with a peer group of sorts is during goat showing season. And my goat friends all understand the pros and cons of an alternative lifestyle. It doesn’t matter what makes us different – what matters is what we have in common, what links us. As I begin to interact a bit more with the local Permaculture group I am starting to feel a little less fringe and a little more like part of something bigger. I hope to extend this link over time. So now all I have left to do is decide what dinners to make over the next few days. And do a bit of baking and make some yogurt. And do a couple of loads of washing. See, I am just like everyone else.